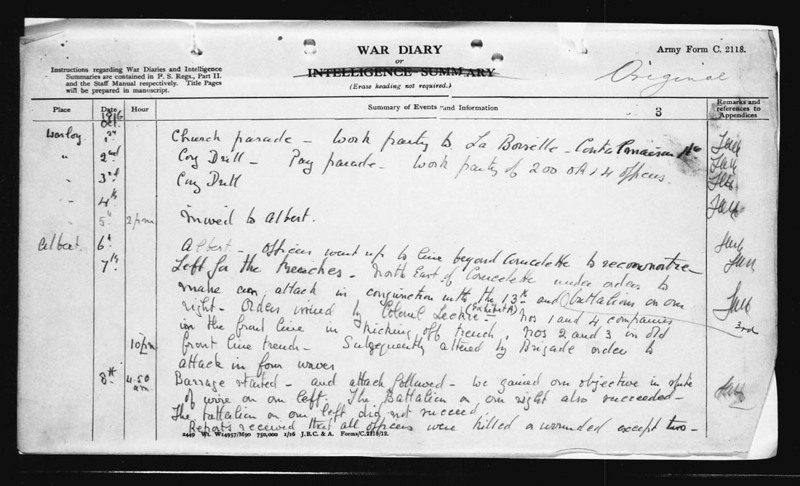 Today’s blog post for the series First World War Centenary: Honouring Canada’s Victoria Cross Recipients tells the story of Piper James Cleland Richardson, awarded the Victoria Cross (VC) for gallantry during the Battle of the Ancre Heights on October 8, 1916 at Regina Trench, Somme, France. Born in Bellshill, Scotland, on November 25, 1895, Richardson immigrated to British Columbia where he served as a piper in the 72nd Seaforth Highlanders of Canada. 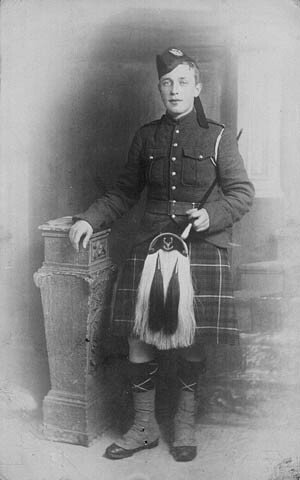 In September 1914, he enlisted with the Canadian Expeditionary Force (CEF) and went overseas as part of a large Seaforth contingent of the 16th Battalion (Canadian Scottish). On October 8, 1916, Richardson’s company was held up by uncut barbed wire and intense fire as they attacked German positions at Regina Trench. Richardson’s commander, Lieutenant-Colonel Cyrus Peck, later wrote of Richardson’s extraordinary courage. 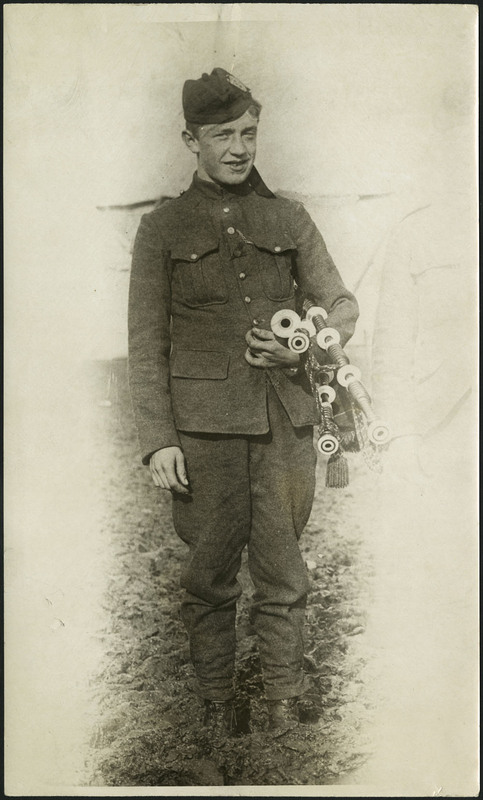 As the unit lay trapped in the shell holes of “no man’s land,” Richardson, a teenager who had played the company “over the top,” sought the commander’s permission to play his pipes again. In full view of the Germans, he marched up and down the wire entanglements playing his pipes where his fellow soldiers lay. His citation for the Victoria Cross states, “The effect was instantaneous. Inspired by his splendid example, the company rushed the wire with such fury and determination that the obstacle was overcome and the position captured” (London Gazette, no. 30967, October 22, 1918). Amazingly, Richardson survived the attack and was detailed to take a wounded comrade and several prisoners of war to the rear. Realizing that he had left his bagpipes behind, he returned to recover them. Richardson was never again seen alive. The remains of James Cleland Richardson were located in 1920 and he is now buried in Adanac Military Cemetery near Albert, France. His bagpipes, long believed lost to the Somme mud, were identified in 2002 as being in the possession of Ardvreck Preparatory School in Scotland, part of a 1917 donation by British Army Chaplain Major Edward Yeld Bate. They are now on display at the British Columbia Legislature. Library and Archives Canada holds the CEF service file for Piper James Cleland Richardson. The James Richardson fonds contains his Victoria Cross certificate as well as an exercise book from his early schooling. Emily Monks-Leeson is an archivist in Digital Operations at Library and Archives Canada. My grandfather’s uncle, Alexander Turnbull, was part of the 43rd Battalion and was killed at Regina Trench on October 8, 1916. His body was never found. My mother and I visited Regina Trench cemetery on October 8, 2016 and I played the pipes in his memory. Later that day we visited Adanac cemetery to see piper James Richardson’s grave and I played again. I wonder if my relative heard piper Richardson play on the day he died.